Is bitcoin finally going mainstream in the Midlands? Hanging around with bitcoin enthusiasts is intoxicating. It's a seductive idea, free magic money from the internet. And while purchasing, trading and selling bitcoin once was a complex and technical process it's all about to become a lot simpler. But first if you want to understand more about bitcoin and other coins built on the same technology there's a BBC explainer here. In Coventry you can now buy and sell and even spend bitcoins. 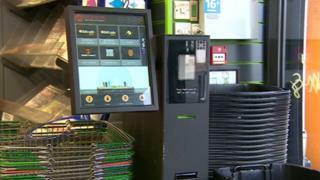 All thanks to a nightclub and one of the country's first bitcoin ATM machines newly installed in a shop in the city. Nestled next to the newspapers, the machine has a large touch screen and makes the process of buying and selling bitcoins pretty painless. You need a wallet app on your smartphone to download and store the bitcoins once you've bought them and there's a £10 fee for each transaction, but otherwise it's pretty simple. Round the corner the S7EVEN nightclub is tweaking its tills so they can accept bitcoin. As the owner Kevin McCloskey (who also invests in the currency) explained to me, it's likely they'll start by accepting bitcoin for larger items first; so a booth booking with plenty of booze rather than a single pint of lager. But eventually staff with have T-shirts with scan-able codes so customers can tip in bitcoins directly. But all this does illustrate one of the problems of bitcoin in the real world. First of all, why spend it at all? The price may have plunged from the pre-Christmas highs but plenty of people believe it will climb again and so would rather hold on to it than spend it. There's also a technical limitation which isn't often discussed in the media. The Visa company behind your credit or bank card can process thousands of transactions a second. The technology that makes bitcoin so exciting also has a built in technical issue that means the upper limit of bitcoin transactions is about seven a second. That's not very useful for the future of money. And of course this is all unregulated, it's really the financial wild west. I've met people who've turned £500 into £200,000 but I've also talked to people who made and lost thousands too. If something goes wrong with a digital currency there's no-one to turn to. And mixed in with all this are people using these currencies to buy drugs, extort money and build scams and Ponzi schemes. But as I said at the start it's all extremely seductive as an investment idea, surely we can all be rich? Well maybe some people will get rich just as some people win the lottery. But to misquote the old lottery slogan, it probably won't be you. And you could lose everything.